Apparently Ava's grandparents wanted to see her start walking. Or perhaps the word got out that Krista was looking to get Ava a walker. Whatever the reason, Ava has received another contraption intended to help her join the ranks of bipedal toddlers. And she really likes it. However, she doesn't seem to be using it correctly. 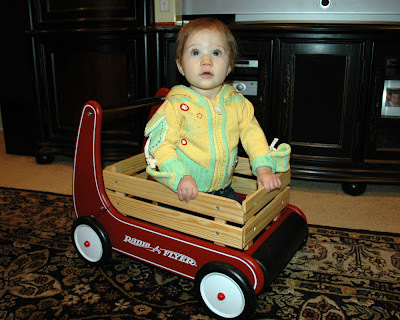 Grandma and Grandpa Furr sent Ava a Radio Flyer Walker Wagon for her birthday. But rather than pushing it around, Ava enjoys to instead sit inside of it. Once inside, she then ponders how she will get back out. Realizing she's helpless, she will look to us for help. We then get her out, only for her to climb right back in. Our attempts to get her to use it as a walker typically end with Ava buckling her knees and flopping onto her belly. As for the Fisher-Price Stride-to-Ride Lion she got from Granny O and Freddy O, Ava really enjoys playing with it as well, but not as a walker. Instead she likes pushing the lion's nose, which causes it to emit a playful roar followed by island music. Ava loves to dance and bop along to the music... with feet firmly planted. She's darling - and she'll be walking before you know it. What fun gift! As fun as it is to have them walk...it's not at the same time!! Enjoy the time!! 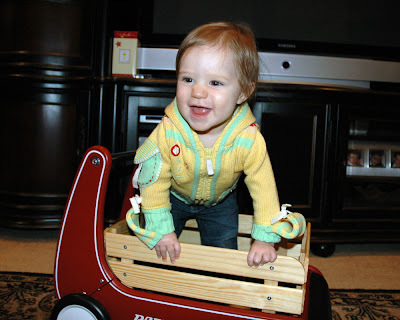 She's adorable though...and that wagon thing look like fun!!! Her hair is cute when it's just flat like that :) Hope you're having a good trip!!! 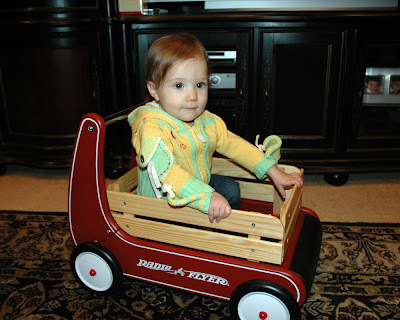 She looks so adorable sitting in that little wagon. I love her little sweater. Don't worry, she will be walking before you know it. It happens so fast. Have fun in PA.